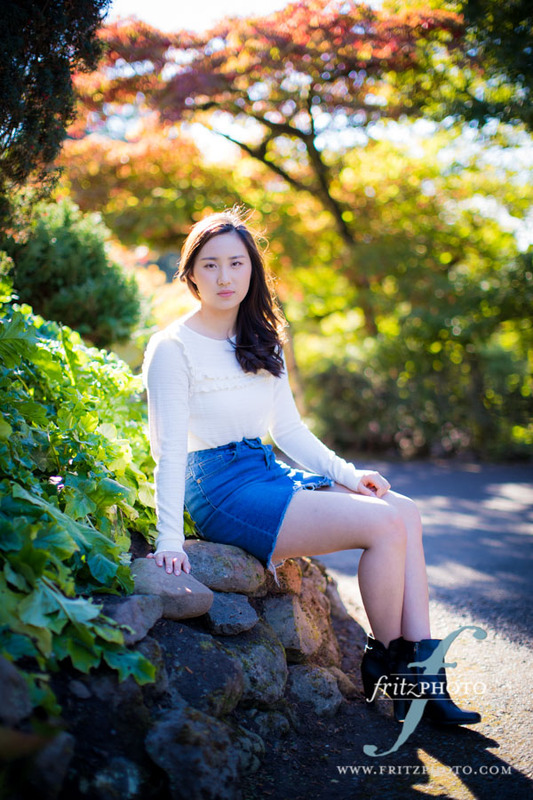 We really enjoyed photographing Lauren Chung’s senior portraits at Jenkins Estate this fall. It was one of those stunningly clear fall days, with warm sunshine and a rainbow of colors in the trees. The absolutely perfect day for senior photos! 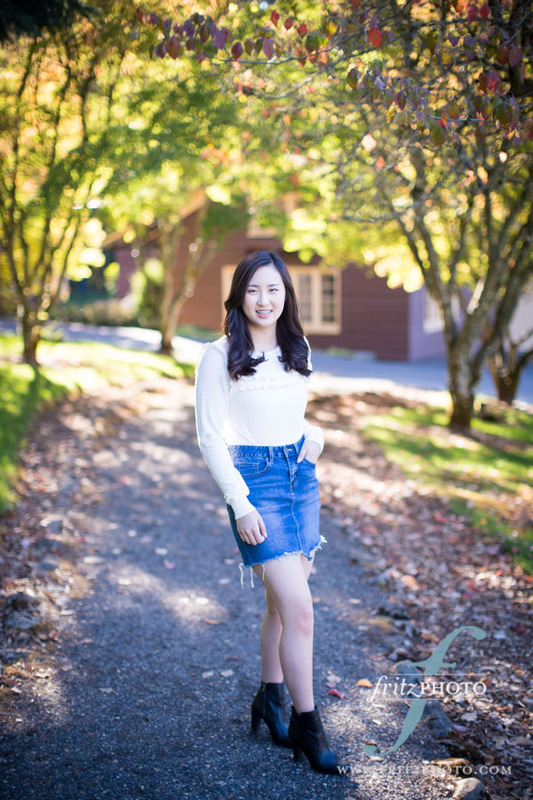 Lauren is a senior at West Linn High School in West Linn, Oregon. As we took her senior portraits, we walked and talked about school, college, and her future. We’re excited to see what the future holds for this bright young lady! Ready for your senior portraits? We’d love to bring our award-winning photography to this special time in your life. Contact us today to schedule your portrait session! Michele and Doug were married on July 28th, with a ceremony and reception at The Resort at The Mountain in Welches, Oregon. It was such an honor to provide their wedding photography for their Mt. Hood wedding! For Michele and Doug’s beautiful summer wedding, Amy van Riessen was the primary wedding photographer, and Laurie Carter acted as second shooter. Amy started out the day capturing the ladies as they got ready. Meanwhile, Laurie started with the gentlemen. Once everyone was ready, the wonderful resort staff at The Resort at the Mountain shuttled Doug on the golf cart to a beautiful streamside location for the first look. Then, the cart circled back to bring Michele to join him. The secluded streamside location was so romantic—perfect for a first look. After the first look and few couples’ photos, we joined the wedding party and family by the ceremony site at Pine Cone Bluff. There, we took formal photos with the beautiful golf course and mountains in the background. The Resort at The Mountain provides simply stunning views of the Cascades, so the backdrops for their outdoor wedding photography were magnificent. Everyone at this wedding was incredibly sweet. We loved to see this blended family come together. Michele has a 9-year-old daughter named Kalli, and Michele and Doug have a 9-month-old son, Easton, as well. We loved how Doug walked down the aisle with Easton! Michele was escorted down the aisle by Kalli, and the two of them met up with Michele’s parents up front. Together, her daughter and her parents gave her away to Doug. It was such a great way to celebrate their new family unit and illustrate that they were becoming one family. As if that wasn’t sweet enough, Doug made sure to share a special dance with his new stepdaughter. It was one of Amy’s favorite moments as their wedding photographer! It was such a fabulous way to include Kalli in the celebration. We love the images of these two dancing together because Doug didn’t hold back! And really, Doug wasn’t on the dance floor much other than that dance. He claimed he didn’t know how to dance. So it was really special how he put himself out there share that dance with Kalli, who was quite the dancer! Doug & Michele, thank you for allowing us to be part of your amazing celebration. We loved seeing your family come together. We’d also like to give a special thank you to the wedding coordinators at the Resort on the Mountain. They did such a fabulous job ensuring the events of the day went as planned and shuttling our team around on the golf cart. They always make the day go smoothly! Briana and Eric were married on June 9th, with a ceremony and reception at McMenamin’s Edgefield. It was such a joy to be the wedding photographers at their gorgeous Edgefield Wedding. Since we are considered preferred wedding photographers for McMenamin’s Edgefield, we’re thrilled when our couples choose it as their wedding venue! When we arrived at Edgefield, Laurie, the second shooter, went to hang out with the guys, while Amy, the primary shooter, was with the ladies and the “flower dog.” That’s right—they got a special floral leash and a bridal veil for their dog so that she could be part of their special day. What a great way to make sure that their whole family is in the wedding! As we took “getting ready” pictures, we were all worried about the weather. We didn’t know if we’d be able to get those formal wedding portraits outside, because the rain wouldn’t let up at all. But just in time for the first look, we got a break in the clouds! We headed out to the Edgefield Gardens, where Eric and Briana saw each other for the first time. We were able to capture some great wedding photographs of these two out on the beautiful grounds. From there, we met up with the rest of the wedding party and their family for formal wedding portraits by Blackberry Meadow. And right after the last formal portrait was done, the clouds once again opened up with rain! It was perfect timing! Because of the rain, the ceremony was moved inside Blackberry Hall, where their friend officiated the ceremony. We took some time for Eric and Briana to sign the marriage license before we took a few more photos of them as husband and wife around the grounds and headed back for the cocktail hour and reception. At one point during the wedding reception, we had a short break in the rain—and a rainbow came out! We ran outside to grab a photo of the couple with the rainbow before it faded away. Even with all of the uncertainty with the weather, we never saw Briana and Eric stressed out or overly concerned. They never stopped smiling—all day—and always had these looks of pure joy and happiness on their faces when we looked at them. Thank you so much, Briana & Eric, for making our jobs as wedding photographers so easy. Your joy spilled out into all your wedding photography, and we felt like a valued part of your day. We met up with Macey at Jenkins Estate in Beaverton, Oregon, on August 10th for an amazing senior session. We’d already done her big brother’s senior portraits last year, so we were excited to see another member of the family getting ready to take on the world. This amazing girl goes to Grant High School in Portland, Oregon, where she runs cross country. She’s really good at it, too—she’s gone to state every year! She had just returned from a week at the Steens Running Camp, a wilderness running and camping experience in Oregon, where her longest day was 28 miles of hiking and running. What an amazing athlete! Macey is also incredibly intelligent. This year, she’s excited about her Constitution team as well as the tough classes she’ll be taking on, like AP Physics and Calculus. While we were able to get some great images of Macey to show off her personality, our favorites were the ones that showcased her beautiful blue eyes and her teddy bear jacket. And, of course, we were thrilled with how the image turned out that we shot with a specialty lens. The Lensbaby Twist 60, which is made in Portland, gives the background that lovely, swirly bokeh. Macey, thank you for allowing us to photograph your senior portrait session. It was amazing to get to know you. We know that you’ll be amazing as you take on the world! The bride with her junior bridesmaids are picture-perfect at The Aerie at Eagle Landing. Darren and AmyLynn’s wedding at The Aerie at Eagle Landing was picture-perfect! From the stunning bride, to the Pinterest-perfect reception, this was such a beautiful day to photograph. We love being wedding photographers at The Aerie at Eagle Landing. This wedding venue has it all: from intimate rooms, to wide open golf courses, and it allows us as wedding photographers to capture so many different beautiful moments and moods at the wedding. AmyLynn was full of laughter, until just before she walked down the aisle: And then the smiles came out again! These groomsmen loved their whiskey flasks! Portraits of the bride and groom in the golden hour before sunset…so warm and lovely. A little peek-a-boo from a bridesmaid made us all smile! Photos of the bride and groom outside of The Aerie with a classic car are so fun. Darren & AmyLynn’s wedding party looked great around the Bentley! AmyLynn had so many Pinterest-worthy props at her wedding. We loved photographing them. This one was especially lovely: the silver I-Do fork set. Are you looking for a wedding photographer for your wedding at The Aerie at Eagle Landing? We love photographing weddings there. Contact us today to tell us all about your wedding; as award-winning wedding photographers, we’d love to tell your love story! We loved celebrating this sweet couple, Bridger and Cameron, at their wedding at Abernethy Center. We had a great time photographing at the Abernethy Center’s Abigail’s Garden, in Oregon City. Bridger and Cameron were wonderful hosts at their wedding, so thoughtful and inclusive. Cameron and Bridger could best be described as laid back and full of joy. And their wedding definitely reflected that throughout. They had many personal details throughout their special day. But the most touching part was how they incorporated sweet reminders of Cameron’s father who had passed away. He had his own chair at the ceremony with his plaid shirt hanging on the back of it. And both the bride and groom had a piece of jewelry with her dad’s ashes in it, as a reminder that he will always be a part of their new family. They did a fabulous job honoring his memory. The reception was a blast and party was pumping… going as far as pulling the photographers out on the dance floor! And how could we say ‘no’ to that? Bridger and her bridesmaids had so much fun together as they got ready for the wedding! Abigail’s Garden at Abernethy is such a breathtaking wedding venue! The wedding party looked great all together in Abigail’s Garden at Abernethy Center! Congratulations Bridger and Cameron! We wish you all the best! And the reception was a blast! The tented area at the Abernethy Center Abigail’s Garden is a fantastic place for a party. Congratulations, Bridger and Cameron! You were such a delight to work with; we loved being your wedding photographers at Abernethy Center! A fun, laugh-filled engagement session! We had a blast photographing Melissa and Michelle’s engagement portraits! The entire session was full of laughter, especially as they saved our photographer, Amy, from falling into the river with all her equipment. We are so excited for their wedding at McMenamins Cornelius Pass Roadhouse. We cannot wait! We loved photographing these engagement portraits on the Eastbank Esplanade. We love photographing at Jenkins Estate in Beaverton! 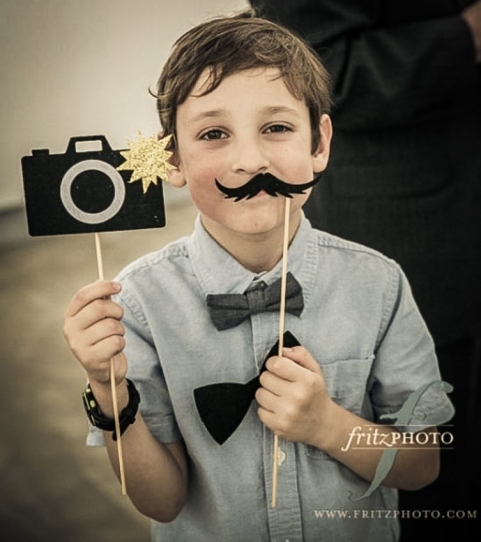 Josh– My favorite moment was minutes before I walked down the aisle. We were all in formation in a room ready to walk onto the field when I realized it was over. The planning, the details, the stress. All that was left was to walk out, explain how I love my fiancée, and enjoy the company. I finally remembered that she had already said yes when I proposed, and that is really all that mattered. Chanda– We decided to incorporate the Jewish tradition of Yichud into our wedding, where the bride and groom have a few moments of seclusion away from the guests directly after the ceremony. It was wonderful to sit with my husband and reflect on our journey together. Josh– For Christmas I thought it would be funny to get my brother in law and father in law samurai swords. They were a cheap find online. I would never have imagined that those swords would be making an appearance in our wedding pictures. Chanda– We had forgotten that we picked a song from Star Wars as our recessional- it caught us off guard and we giggled the whole way back down the aisle. Josh– “As long as I can dance at your wedding” became a common saying for my ailing grandmother. Unfortunately she passed in 2010 and was never able to attend my wedding, so we brought a photograph of her and gave it a space near the dance floor. Also my wife’s train kept falling down. Her sister/ bridesmaid kept trying to pin it up to no avail, so I just held it for much of the night. It was a nice excuse to be close to my wife. Chanda– We had a longtime friend of ours perform our ceremony. He knew us both well and did an incredible job with the ceremony and added the perfect amount of personalization. Josh– I wore a custom three piece suit and shirt from The Duchess Clothier in Portland. Chanda– I found my dress at Bridal Exclusives, and my veil was the same veil that my mother-in-law wore at her wedding. Mozel tov to the happy couple! Can you give us a list of your wedding vendors? Our wedding was at the Jenkins Estate. Are you looking for a Jenkins Estate Wedding Photographer? Contact us today; we would love to be your wedding photographers!